This Christmas I have been spoiled rotten. 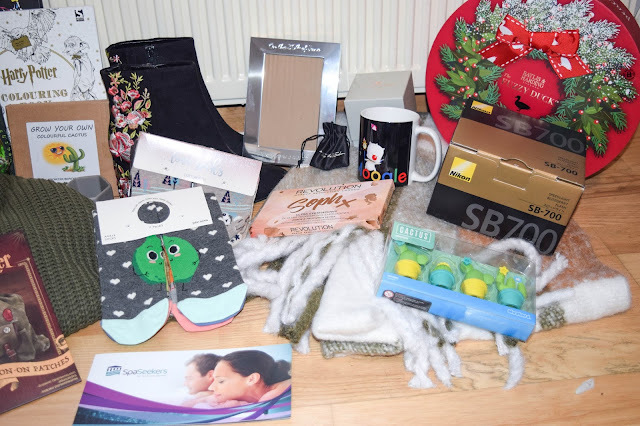 This year I made extra effort on presents and I was so happy that it paid off. Seeing everyone's reactions and how happy they were with the gifts I gave made me happy too and Christmas a total success! I got some really lovely and thoughtful gifts this year too. I know lots of people have mixed feelings about this post, but I like them, so here we go! There's a lot and I don't know where to start but I do love looking at everything together and thinking about how well my family and friends know me. 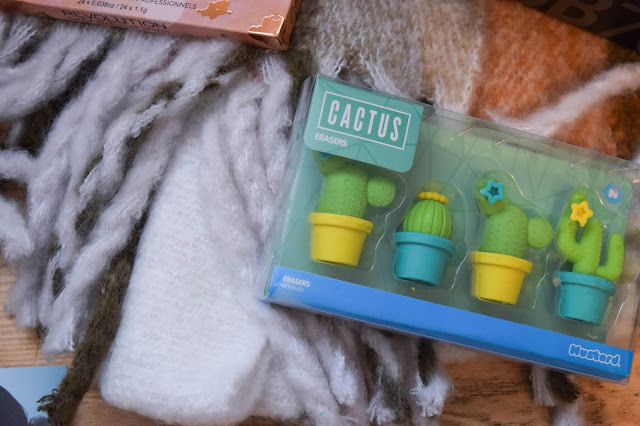 I've got fashion loves all the way through to my favourite things like Harry Potter, doughnuts and cacti. Talking of cacti, this year my love for cactus things is strong. 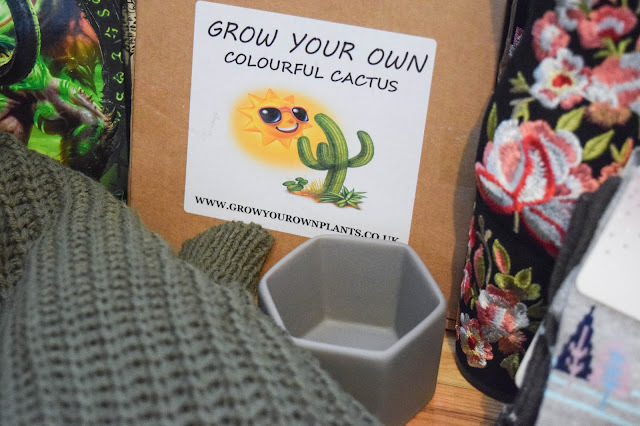 I received some cacti erasers, some magnets that are on my board at work - both from friends, and a 'grow your own cactus' kit from John! He even bought me a little pot to start it in. It says it's a colourful one so I'm hoping to see it flower eventually. 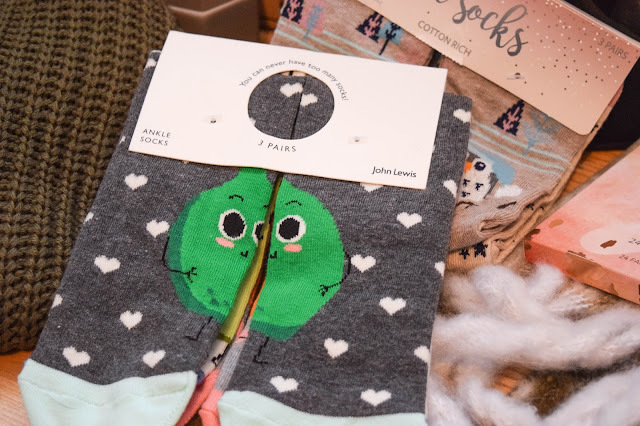 This year I got lots of socks and because my current ones are pretty worn out, I was very excited about these. They're proper cute too so I'm a happy gal. 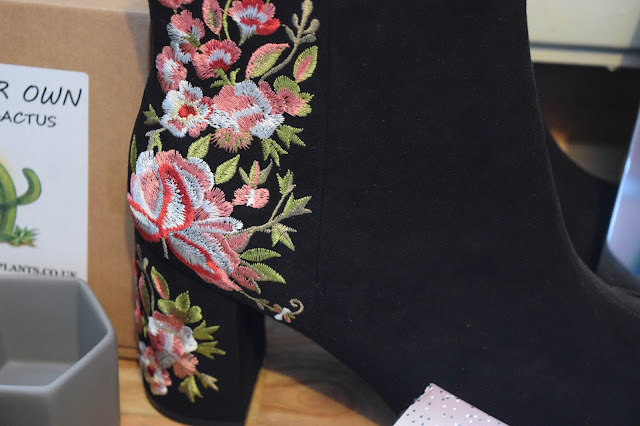 John also bought me these gorgeous boots that I'm going to blog about all on their own soon. They're so beautiful and they fit amazingly. John pointed these out in M&S months ago and I fell for them instantly. They even made it onto my Christmas wishlist because of him... Cheeky! The boy has style though! My uncle surprised me with a palette I didn't actually tell anyone I wanted. I thought about buying it so many times and since receiving it, it's all I've been using for my eye makeup! 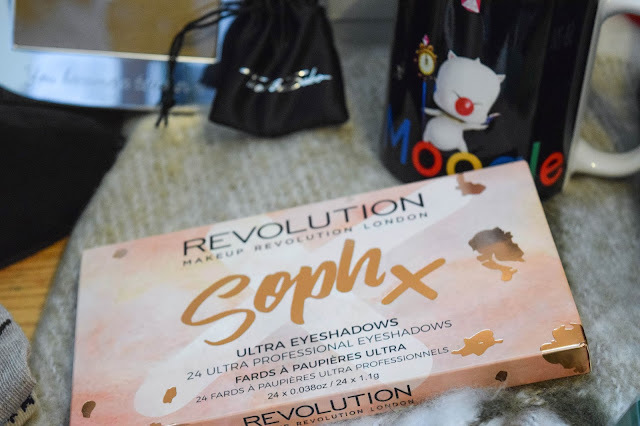 This is the Soph Makeup Revolution palette and it is gorgeous. I decided this year not to focus on beauty on my blog anymore so I'm not going to review this, but I'd totally recommend it! The colours are so me and I've created some lovely looks that I've been sharing each day on my Instagram story. Notebooks are always a winner with me and I haven't got one with my letter on so I was happy to see this under the tree from a friend. 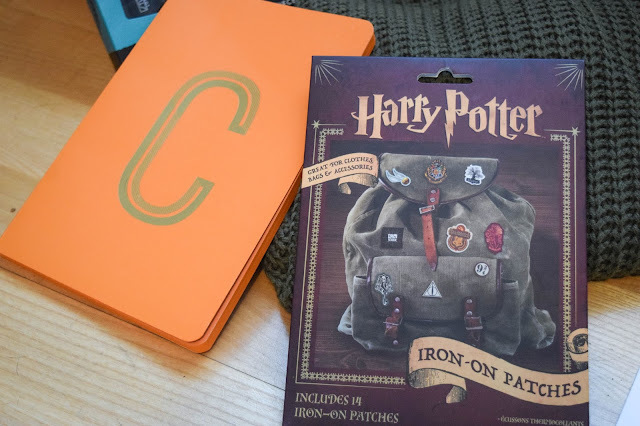 I also got some iron on Harry Potter patches from my sister! I'm tempted to buy either another denim jacket to put them on or a bag. I haven't decided yet. My brother and his girlfriend were sweethearts and bought me and my best friend Ana a spa experience with afternoon tea! 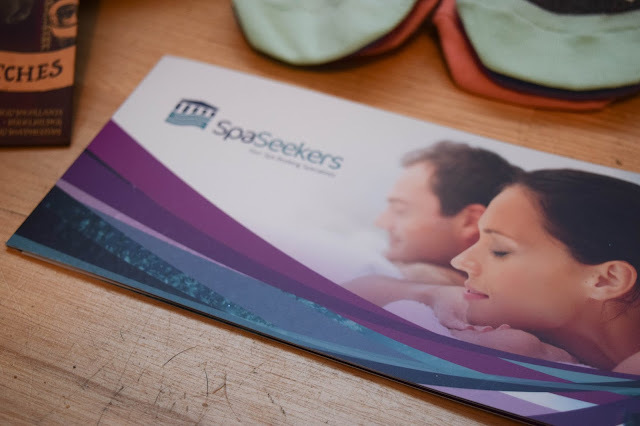 This was such a cute surprise and we're going to book it for some time in January I think. It's such a cute present and I can't wait to do book this! My parents surprised me with a gift I never expected and appreciate so much because it was so thoughtful! I couldn't believe this was under the tree but it was something I said to my sister back in September/October that gave them the idea of buying me this for Christmas. This is a Nikon external flash for my Nikon D3300. 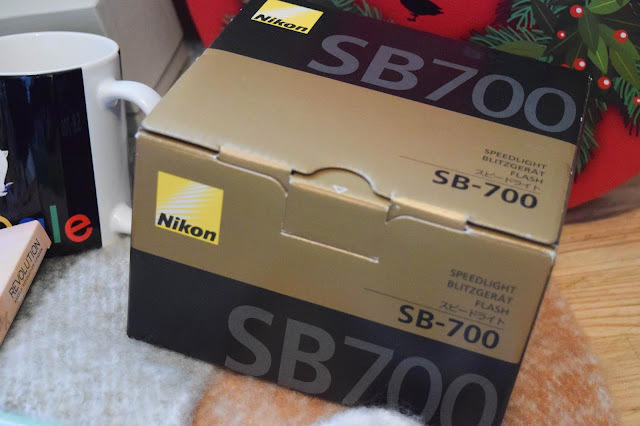 I remember trying to borrow my sister's flash after seeing how it worked and then realising it wasn't compatible for my camera. I never bought myself one but said that I might look into getting one soon. Little did I know this short conversation with my sister resulted in this gift. It was so amazing, such a surprise and I absolutely love it. John also surprised me with a gorgeous new watch. 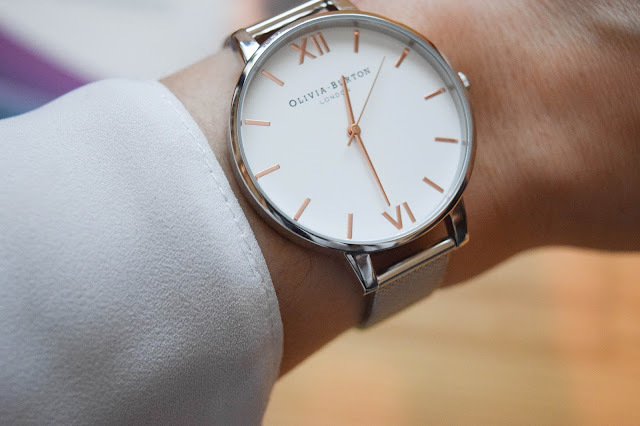 One I love A LOT more than my previous Olivia Burton watch. This one is similar to my old one but in silver, with a silver metal strap and gold detailing. Its so beautiful and sits well with all my other jewellery too! This is going to be like my 'weekend watch' because I also have my Fitbit for during the week. But I'm totally in love with it. It's nice wearing an analog watch again! Next I have another gift from John and one from my best friend Ana. After being the only thing I ever ask John for, he got me another charm for my Thomas Sabo bracelet. 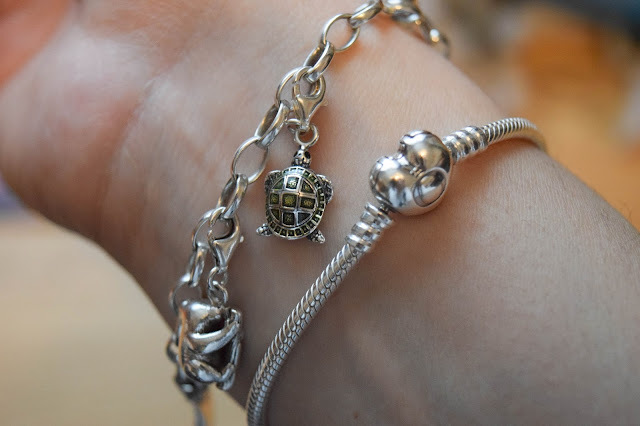 This time he got me this cute turtle charm which symbolises a lot for me including our first holiday to Zakynthos back in our first year together. I love this charm because it's got a subtle bit of colour but not too much. Just enough that it stands out a bit but fits well with the other silver charms. Ana was such a sweetheart and bought me the most thoughtful and lovely gift! She bought me a Pandora bracelet with a heart clasp because she knew I didn't have a Pandora bracelet to put my Pandora charms on after collaborating with Pandora in recent events! I couldn't believe it and popped my charms on it as quickly as I could. It looks beautiful and I can't wait to continue my Pandora charm collection alongside my Thomas Sabo charm collection. Another fun and cute gift from John was this mug. I never get mugs for Christmas so I was over the moon to finally get one! This one has a Moogle on it from the Final Fantasy games. It's so cute and the word 'Moogle' is in the infamous 'Google' text. 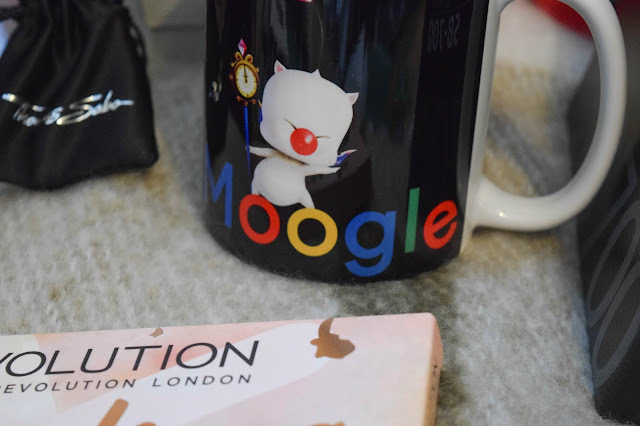 I think it's a brilliant play on the whole google/moogle thing and is a cute mug! It's my new favourite. The final present I'm going to mention is one I forgot to photograph with the rest because I was wearing it whilst photographing! 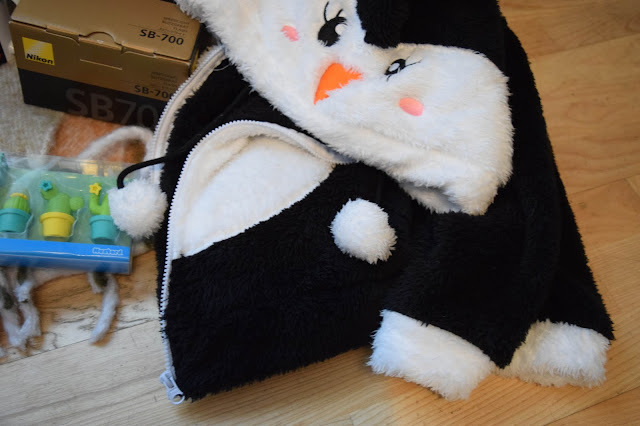 This is my cute new penguin cosy hoodie that my little brother got me along with the doughnut pillow he bought right in front of me and said was for someone else! I thought he was so cheeky but so sweet too. He remembered me saying about liking and wanting cosy things this Christmas and delivered. He's so sweet! 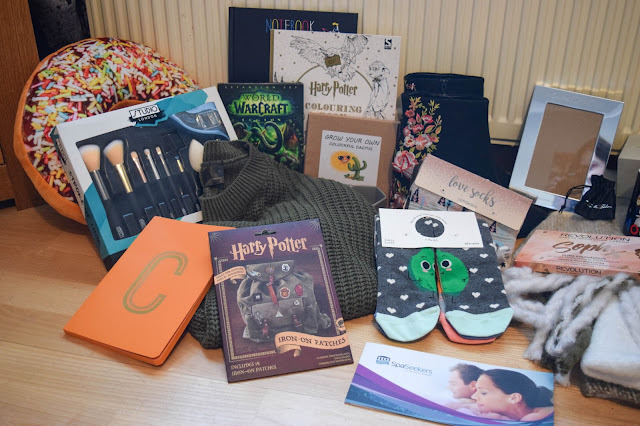 Other gifts I got included a bunch of chocolate, World Of Warcraft Legion expansion pack (which is currently downloading), a jumper, colouring books, toiletries and the cutest frame marking the day I graduated from my course this year! I couldn't be happier with the gifts I received this year and I appreciate every single one of them individually. Thank you to all my friends and family for my gifts, I love you all! 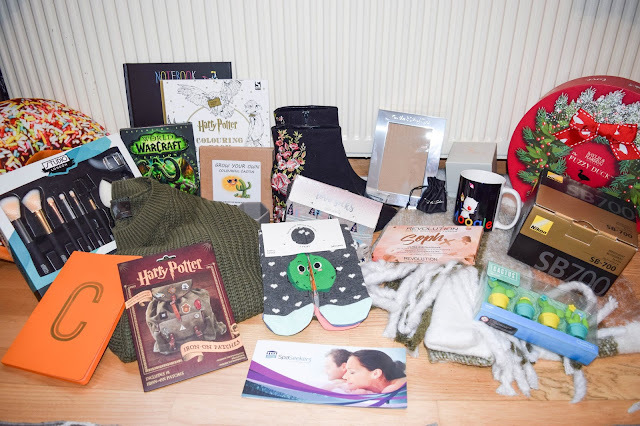 Omg looks like you got so many lovely gifts! I got the soph palette too! THE COLOURS ARE SO NICE! !